This is the unlocked weapons, free upgrades, VIP and money hack for Brothers in Arms® 3 latest update version 1.4.3d which was officially released on May 12th, 2016! BIA3 Sons of War is a third-person cover-based shooter, developed by Gameloft, set in World War II Nazi Germany. As you play, you'll find yourself most of the time taking cover behind sandbags shooting your way through a bunch of Nazi soldiers in varied locations. It's not a still-shooter though like Kill Shot Bravo because you can move freely and fight soldiers at will! The game is free to play but is full of inapps. You'll need real money to buy things in order to advance through the different short missions and levels. 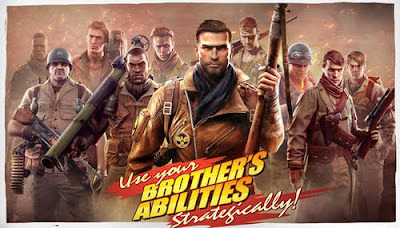 That's why we made this Brothers in Arms 3 mod apk which offers unlimited stuff like medals, and free shopping which unlocks the premium elements without the need for real currency. The gameplay is varied as it combines defending, attacking, sneaking, and shooting missions. It's got everything WW2 related including the environments, soldiers, war gear, and intensity. Plus, the highly detailed visuals allow for a truly immersive fighting experience. Now head down to grab Brothers in Arms 3 unlimited money apk and join your brothers on the battlefield! - Brand new maps and game modes! Install APK, Download data files ingame, Copy Data folder to Android/data, and play online. If you face “Invalid license” error, visit the game on Play Store, click “install”, then quickly cancel the installation to get the game license. thanks for your feedback Antonio! I forgot to mention that this latest version may crash on some devices (only some)! please wait for an update or try some other site for some other version! Bro i am using mi5 and redmi note3 on both phone it's crashes. Please help, i love this game please help please. Which version?? I tried 1.4.3d, but didn't work. i uploaded new mod, did u try it?! Where is new version? Is it here above? ?